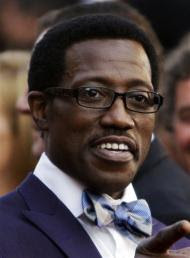 Wesley Snipes is in central Florida to learn his punishment for three misdemeanor tax convictions. A jury found the 45-year-old action star guilty of willfully failing to file taxes for three years, in which the government said he owed $2.7 million. Snipes was acquitted in February of three identical counts and two felony charges of tax fraud and conspiracy. Still, prosecutors are pressing the judge for the maximum sentence of three years in prison. They say Snipes is a "notorious" offender who dogged the IRS for years. Snipes' attorneys say he deserves only probation for the misdemeanors. On Wednesday, they submitted three dozen letters from friends attesting to his character. Those coming to Snipes' aid included Denzel Washington and Woody Harrelson.